This glass kerosene storage container is not marked in any way. The only way we know they were used in lighthouses are that they have been found in many lighthouses. 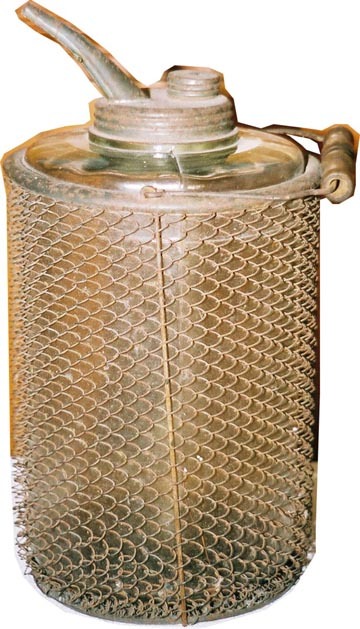 This glass container is protected with a metal mesh screen to prevent it from breaking. Regular metal cans of the same size were also used we have seen. 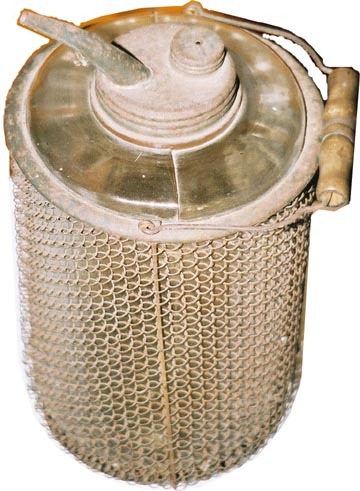 We do not know much more about these cans functions other than it was to hold kerosene for storage before use and with the small pouring spout we might be able to assume that it was used to pour kerosene directly into lamps or lanterns. If anyone has any more information about the use of this type of container please contact us.